Welcome to the first blog from the Voice of Venice. The Voice will be presenting information on downtown Venice and Venice MainStreet. 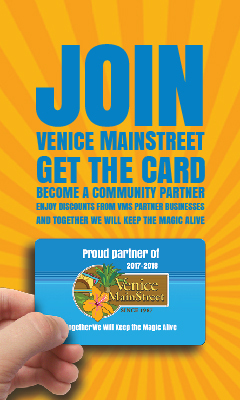 Venice MainStreet is a 501c3 non profit organization dedicated to the Beautification, Historic Preservation, Economic and Community Vitality of our beautiful, downtown area. We will be covering community events that happen downtown, historic preservation activities and community improvements. Expect to hear about businesses opening, closing, moving or expanding. There will be some community profiles done on persons of interest to us. 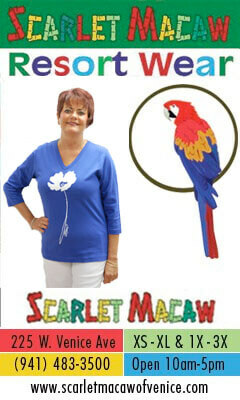 Business stories on new projects or merchandise lines may be profiled. Plus I hope to be sharing many photographs, not only ours, but some of yours. This will be the place to share wonderful stories and photographs. We hope to become a Voice you’ll want to share and enjoy.